Elen Salina called it a 'personal dreamland'. It is. Not so much art as some sort of multi-disco wallpaper. In your face, bright, disinhibiting and run at near disco speed. 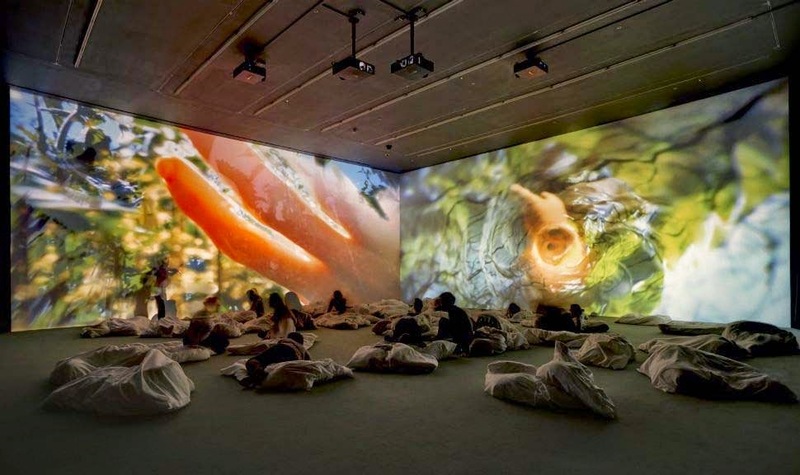 Pipilotti Rist's new audio video 'Worry Will Vanish' runs in a darkened room (the North Gallery), heavily curtained off, carpeted and with small duvets scattered over the floor. One is required to be shoeless. Is one, one wonders, being invited to participate, at least in one's imagination, sensually, with a partner of choice and should one have brought him or her? A billion images flash by and, for me, that's a little too rich, too layered and, on a Saturday morning, a little too much. But if you do feel like being immersed in the artist's dreamland you will find that the images are corporeal. Close-ups of plant leaves and stems mixed in with endoscopic scans of the human gut. Here and there a disembodied female figure floats by, long hair streaming, legs closed, arms by the sides, still as some newly unwrapped Barbie. The camera lingers on a reclining male thigh, the light picking out the blond vellus hairs. But in a flash it's gone. The same thing happens with a short passage of birdsong. There is soundtrack - and actually, the music (by Anders Guggisberg) is perfectly acceptable: I might though have preferred stillness here. Judging by some of the reactions to Ms Rist's parallel exhibition in Hauser & Wirth's Somerset art space where Rist spent a year-long artist residency, I think London may have drawn slightly the short straw here. The Arnolfini Gallery tweeted a still from the Somerset show as their Curator's Choice, a shot of tender male fingers, skin lit almost to translucency by sunlight, caressing a newly opened leaf of what appears to be a nettle busy with photosynthesising. The male, perhaps musing on the population of Cabbage Whites about to raid his crops, is no doubt thinking some manly thought such as 'better nettles than my cabbages'. It's a beautiful video still from Pipilotti Rist's 'Mercy Garden', on show in the Hauser & Wirth Somerset Galleries. It looks well worth making the journey down to Somerset for. As for London, uptight as Londoners are from time to time, all the artist may be saying is 'hey, chill out, you Londoners'.